..so they dance! 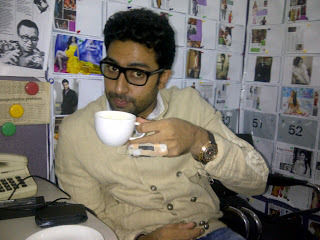 : A small comforting thought: Abhishek Bachchan. A small comforting thought: Abhishek Bachchan. Whenever I think about the new batch of actors and actresses, the ones who've debuted in the period of 2009 - present, I keep this in mind: it took Abhishek Bachchan four years to show promise (Yuva), five years to deliver on that promise (Bluffmaster, Bunty aur Babli), and six years to really make it (Guru). The fact of the matter is, I'm really unimpressed by most of these new stars. I like some of them, but not that much. I see promise in a few of them, but again, I'm not feeling any passion yet. Of course, it bears mentioning that times have changed. The early 00's were a different time, and not to get all nostalgic for a period that wasn't perhaps any sort of high point in Hindi film history - though good movies were made, as always - but nowadays, it just seems that everything moves faster. Stars are debuting in big films, and the pressure is on to make it faster. You've got to be good, and to be fair, most of them are good - well, most of them can dance and look good, at the very least. But that special charm is still missing, that acting ability that has to be beneath the abs or the gorgeous face in order for you to really win the audience over. Again, this is fully subjective. If you feel like these new stars have what it takes already, more power to you; you'll get to enjoy their movies more. For me, that just hasn't clicked yet. But if there's anything I hate, it's sounding like an old grump when I don't feel like one. I'm open-minded, I'm keeping my eyes open, I'm watching films with these new stars even though I'm not passionate about any of them. And most of all, I remind myself: these things can take years, like they did for Abhishek, or Kareena. Awww thank goodness for some love for Abhishek. I know he has the nepotism factor, but with the amount of backlash he faced early on, he had to really prove himself. These days actors get praised far too quickly and then when they can't deliver we're quick to make excuses for them. Hence with all the Deepikas, Sonams, and so many others. The Indian media works in really silly ways. Yep, nepotism cannot be denied but neither can the fact that he certainly had to learn on the job to get to who and where he is today. Nobody was calling him a great actor before he actually began to show promise of being a great actor. I agree, there's much hype about some of the younger stars, but not all of them deliver the goods - at least in my view. It's a shame. A couple of initial thoughts on Dhobi Ghat.